Everybody has tried to shoot a basketball at least once. Most of us aren’t very good at it. Many have tried it 10,000 times or more,1 just trying to hone the skill, hoping to eventually summon something close to reliability. It rarely happens. And even though launching a basketball at a hoop is one of the most widely practiced activities in American sports, every once in a while someone comes along and makes it look like something only he can do. Stephen Curry was drafted into the NBA in 2009. Since then, over the course of 7,000 field goal attempts, he has made the jump shot his own art form. In the same way John Steinbeck built masterpieces from everyday language or Robert Rauschenberg constructed artwork out of popular culture signifiers, Curry is taking the familiar mechanics of shooting to incredible new heights, and he’s turning the basketball court inside out as he does it. Maybe it’s the quickness of his release, or the way he seamlessly transitions from handling to shooting. Maybe it’s the unusually steep parabolic slope his shot cuts from his hand on its way to the bottom of the net. Whatever it is, Curry is more than just the NBA’s most valuable player — he’s also its most breathtaking. Every time Curry rises up and lets a long-range jump shot fly, it’s one of the most riveting moments in sports. That’s due in no small part to its beauty; it’s so certain in its creative intent that it can feel more like you’re witnessing a work of art than an athletic act. 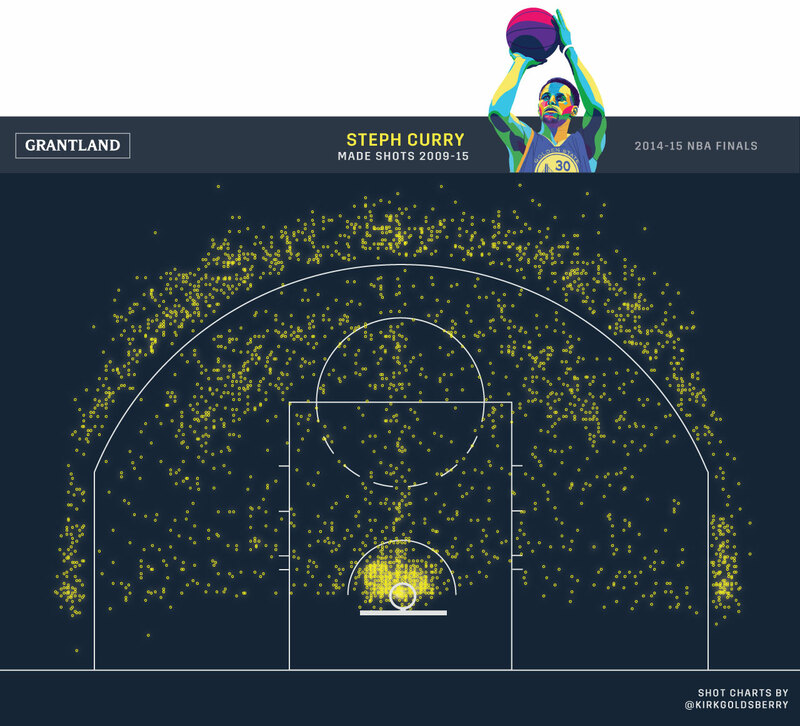 At the end of a career-changing season, and on the cusp of Curry’s first trip to the NBA Finals, let’s take a closer look at his palette. There’s never been a player like this. When Curry is hot, he can make a 3-pointer look as effortless as a clear-lane layup. He is changing how we think of 3-point shooting, and he’s doing it as a point guard. Point guards aren’t supposed to lead the NBA in made 3s, let alone break Ray Allen’s shooting records. Curry doesn’t care. He may play in Oakland, but in the parlance of nearby Silicon Valley, he has disrupted the perimeter market by doing things his own way. Now he’s the CEO of the most exciting start-up venture in town. Usually, 3-pointers are catch-and-shoot affairs. A playmaker wreaks havoc somewhere in the middle of the floor, defensive help collapses on him, and the playmaker finds the open man on the perimeter. The shooter collects the pass, sets his feet, and rises for a relatively clean, unfettered look at the rim. After all, it takes time and space to launch a 9-inch-wide ball through an elevated 18-inch-wide metal ring located 25 feet away. As a result, 84 percent of NBA 3s involve an assist, and 76 percent of 3s do not involve any dribbling by the shooter. But, of course, these typicalities do not apply to Wardell Stephen Curry II. It’s not that Curry isn’t a good catch-and-shoot guy — he most certainly is. He tied for ninth in the league by knocking down 136 no-dribble 3s this season, hitting at a ridiculous 47 percent clip. As you can see above, he’s absolutely lethal in the corners, which is almost exclusively a catch-and-shoot zone. But while those are admirable numbers, catch-and-shoot specialists seldom make the All-Star team, let alone walk away with the MVP trophy. Something else is going on here. It’s telling that the NBA’s top two MVP candidates — Curry and Houston’s James Harden — happen to be the best at creating unassisted 3s. 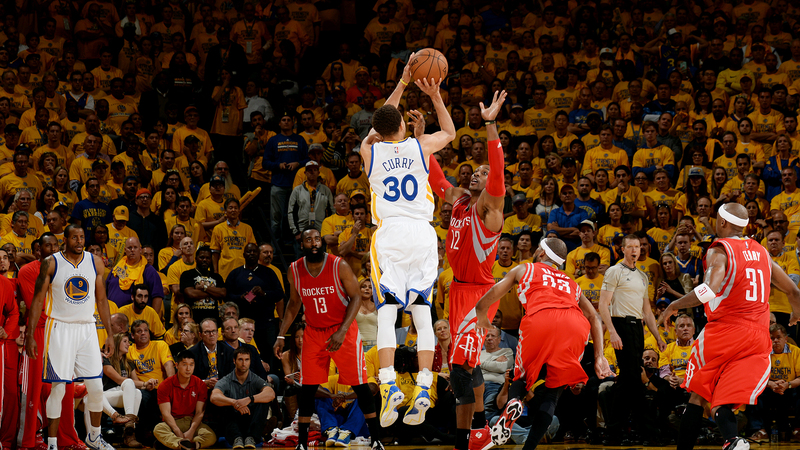 But with all due respect to the inventive skills of Harden, Curry is the patent-holder of the unassisted triple. Nobody on earth can self-generate beyond the arc like he can. This season, the Denver Nuggets ranked 11th in the NBA with 106 unassisted 3s. Curry had 118 by himself. NBA players convert 35 percent of their 3-point shots, but while catch-and-shoot attempts go in 37 percent of the time, off-the-dribble 3s go in just 32 percent of the time. Curry is far and away the best off-the-dribble long-range shooter the NBA has ever seen. Not only does he lead the league in made off-the-dribble 3s, but out of 11 guys who attempted at least 150 of those shots, he’s the most accurate. That doubles as the list of the most creative jump-shooters in the NBA. You’ll notice that Curry ranks first in both volume and efficiency. To put his conversion rate in perspective, that 43 percent effectiveness translates to a whopping 1.27 points per shot. Remember, the Clippers led the NBA in offensive efficiency rating by posting 1.1 points per possession. Anytime Curry can get a 3 off, the Warriors are downright terrifying. Oh, and in a related story, Curry led the NBA in 3-point attempts. And in another related story, the Warriors are in the Finals. During the regular season, Curry broke his own NBA record by draining 286 3s. Over half of those came off the dribble, and nobody in NBA history has ever been able to generate — and convert — his own looks like this. It’s not just that Curry is a great shooter, it’s that Curry is the most creative great shooter ever. Numbers are one thing, and aesthetics are another. One reason we howl with glee when Curry scores is that he makes hard shots look so freaking easy. The quintessential Curry highlight involves a few slick dribbles and a lightning-smooth release that a defender just can’t get a hand to. The dunk will always be the most exciting play in basketball, but draining a long-range shot in the face of a defender is right up there. There are a few intricacies of Curry’s technique that enable him to be both extremely consistent and seemingly reckless. First of all, he has one of the quickest releases in the league. As highlighted in this terrific Sports Science piece from last season, Curry can gather his dribble and release his shot in about 0.4 seconds, much faster than the average player. Furthermore, thanks to an unusually steep shooting trajectory, in the time it takes an average NBA player to gather and shoot the ball, Curry’s ball has already made it 12 feet above the surface of the court. Good luck trying to block his shot. Even if you can get a hand in his face, Curry is the best in-traffic jump-shooter in the NBA. Since 2013-14, the NBA has used its fancy tracking system to catalogue the precise locations of every player in every game 24 times per second. We’re now able to evaluate how the distances between shooters and defenders affect field goal accuracy. 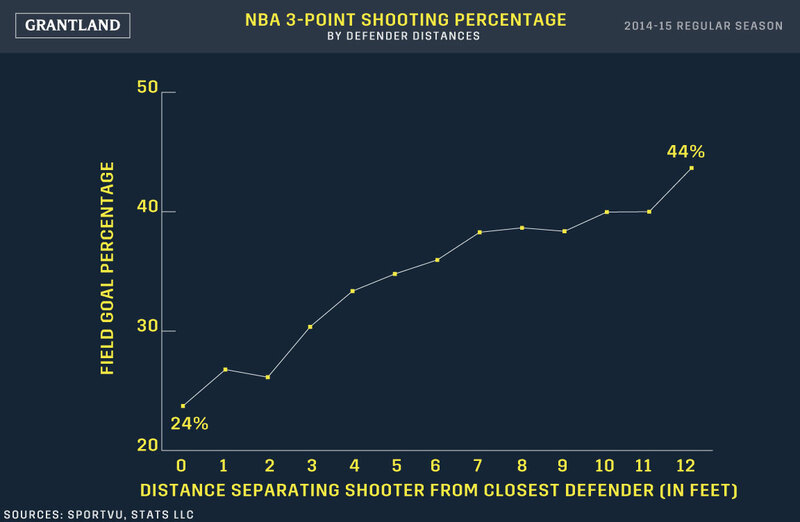 Unsurprisingly, the closer defenders are to shooters, the less likely shots are to go in. But these numbers do not apply to Curry. As you can see, NBA shooters make less than 30 percent of their 3s when a defender is right up on them, but they make 44 percent when the closest defender is 12 feet away. Curry makes 44 percent of his contested 3s. Let me make this totally clear: Curry is as good with a guy in his face as the average NBA shooter is when wide open. We all know that the league is shooting more 3s than ever, but as defenses adapt, shooters will have trouble finding spaces to shoot from. The thing about Curry is that a crevice is all he needs. While it’s hard to overstate the magnificence of Curry’s long-range prowess, the glare from its brilliance has obscured some of the less-hyped developments in his game. Over the past two years, Curry has become a beast in the paint. And I’m not just talking about him boxing out Dwight Howard in the playoffs. Out of 50 players who attempted at least 350 shots within 8 feet during the 2014-15 regular season, Curry ranked eighth in field goal percentage, converting 63 percent of those attempts. That’s a higher conversion rate than Howard, Marc Gasol, and Blake Griffin. Remember when some people thought Curry was soft? Now he’s able to blend volume and efficiency near the paint as well as any point guard on the planet. It wasn’t always this way. As recently as two years ago, if there was a weakness in Curry’s offensive game, it was his ability to score in the paint. 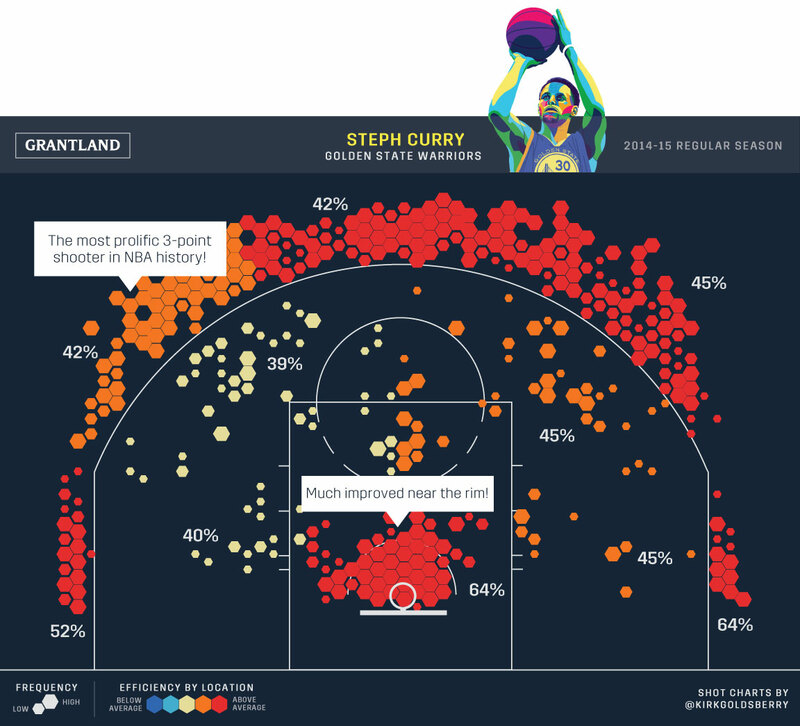 During the 2012-13 season, Curry converted just 49 percent of his shots in this same close-range area — well below the NBA average of 55 percent. In fact, out of the group of 168 players who attempted at least 200 shots inside of 8 feet that season, Curry ranked 151st in field goal percentage. Over the past two years, though, he has transformed one of the few weaknesses in his scoring portfolio into another mighty weapon. Just like he does on the perimeter, Curry has found ways to keep bigger, more athletic defenders at bay with smart, quick, quirky releases that are high in the air before shot-blockers even know they’re happening. It’s hard to imagine someone so relatively slight having such a huge impact on the game. But that’s what Curry is doing — in the same way a great artist changes the way we see the world, he’s changing the way we see basketball. Suddenly, our ideas of risky shot selection, of off-balance attempts, of what is and isn’t “long distance” have changed. About 20 years ago, in the time of Jordan, sharpshooters like Dell Curry (Steph’s dad) and Steve Kerr (Steph’s coach) were niche contributors, mostly relegated to role-player status. Oh, how things have changed. Stephen Curry is the avatar of a new, long-range NBA. As the Finals begin, the 3-point show will be the main attraction, with Curry the starry dynamo at the center. He seems poised to paint his first masterpiece on the league’s biggest canvas.